Special features of the route: The route passes the wooded mountain slopes. Lyutianska Holytsia is situated in Velykyi Bereznyi district. Trip to Mount Lyutianska Holytsia is interesting because the splendor of the mountain spaces Polonyna Ruvna is easily visible from its top. Climb to the top is particularly steep when you come up to the plateau of the mountain. The recommended route of ascent has part of the way, rarely reached by people. Crossing the forest slopes, bushes, windbreaks, you can feel the presence of wildlife. The route starts from the tourist centre “Polonyna”, the village of Lumshory, Perechyn district. You can get to the tourist centre by bus Perechyn-Lumshory. From the village you need to take less than a kilometre along the road leading to the tourist centre, in the direction of the North-East. With your own transport you can get to the tourist centre in the following way. From Uzhgorod drive out to the bypass of M 06 and E 50, turn to the road T 14 03, which leads to the town of Perechyn. In Perechyn take the road T 07 12 in the direction of the village of Polyana. At the 8-th kilometre, in the village of Turia-Remeta, turn aside the villages Turichky, Lumshory, road T 07 23. Then on 7 kilometres from the turn go left in the direction of the village of Lumshory. From the side of Lviv, Mukachevo you need to go to Polyana that is close to the town of Svalyava, and in the centre of the village turn to the pointer – Perechyn. At the terrirtory of the tourist centre there’s enough space for parking the vehicle. From the centre of the tourist centre we are heading by a dirt road in the north-eastern direction. Going along the right bank of the creek Turytsya, we pass waterfalls “Solovey” and “Partyzan”, cross a few meadows and after 2.3 km go to the road fork and the merging of two streams. We are leaving to the left by an abandoned road leading to the North. We pass 0.9 km up the hill, cross to the left bank of the creek, at the point where two small streams merge. The next 300 metres we continue going in the north-east direction along the creek until the next streams merge . At this point we need to climb the steep, narrow spur that runs up to a plateau almost 1.5 km. After passing through dense thickets of young beech a spacious meadows, covered with thick grass and bushes, blueberries, cranberries suddenly opens in front of us. Everywhere on the plateau the stone “spots” covered with moss and lichen are towering . Coming out of the wood, we head to the Northwest to the highest point of the mountain. Here the mountain road preserved , from which it is just 600 meters to our goal. 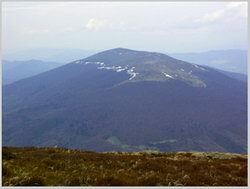 In clear weather from the top of Lyutianska Holytsia the nearby mountains: in the South East – Polonyna Runa; in the West – Mala Holytsia; in the East-Mount Hostra Hora and the ridge Bukyuska Polonyna, are clearly visible. To the north the mountain village Lyuta is located. Moving in the opposite direction we take the mountain road in the direction of South-East. From the top to the edge of the forest the road passes through the open plateau 2.5 km. In the forest a steep descent starts, which stretches 950 metres. Coming out of the wood you can see a beautiful meadow, usually covered with a scattering of wildflowers in the summertime . The next 0.5 kilometres are strictly in a southerly direction leading to the forest road. 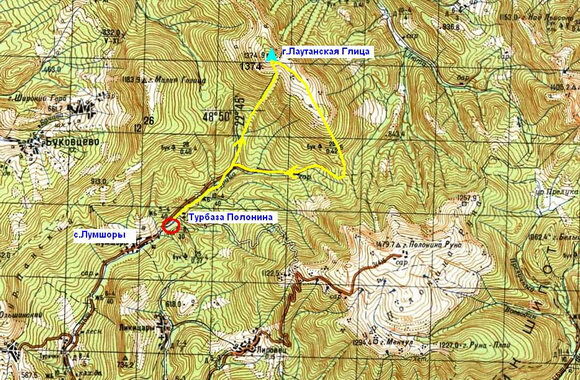 Further the road leads to the west along the creek Turytsya and after 2.2 km. merges with the old road, by which we began the ascent to the goal. Further passing the places we had seen before we easily reach the tourist centre “Polonyna”.